In 1819, Luke Camp, a local businessman and mill owner, donated land to be used as a common. This land was rough and unimproved, but created a nucleus for the village. In 1822, the Baptist Meeting House was build just beyond the east end of the common. Thompson Beech owned a portion of land between the common and Baptist Meeting House which he sold to the town. By 1825, the village took the form it has today except for minor encroachments and road changes which were common during the 19th century. The common appears to have its boundaries defined by the roads which surround it, but actually the road did not create its boundaries. Because of the ambiguous border, there was difficulty in maintaining the integrity of the town common against private abuse. Houses had to be set well back from the road on the south side of the green with no dooryard; evidence of this history remains today. At one point owners of the three houses on the south side of the green wanted to and/or did purchase land which was part of the common to create dooryards, and the legality of the sale was disputed for several years. Eventually , the sale was determined illegal because the land was required in the deed to be a green or common. The land was bought back by the town. The houses on the south side of the green still have no dooryards, but the residents maintain the land in front of their houses as if it were their own. The first community concern for the common was expressed in 1838 at town meeting. A committee was appointed to study the common and make recommendation for defining and improving the green. The committee submitted a report the following year which was not acted upon. At that time, an ordinance was passed to keep animals off the common, because it was previously used as a pasture. 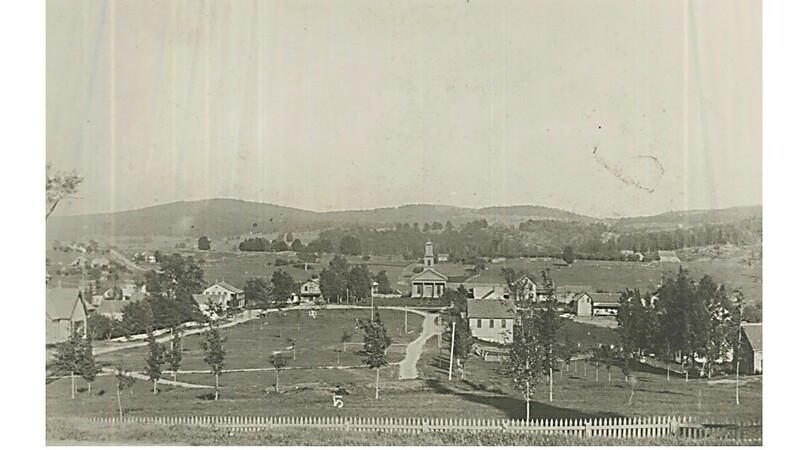 In 1840, a new Congregational Church was built on the hill above the original church. It was located off the center line of the common, as it was to be lined up with the North Star. 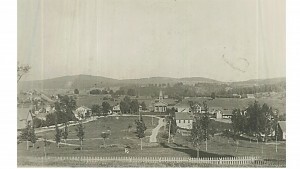 When the old church was torn down, the common appears to be much larger. In the 1880’s, the common was plowed, harrowed, and thickly planted with maples and elms. New roads were laid around the perimeter to discourage cutting across it. However, only the trees on the high ground in front of the Congregational Church survived, so it is now a mostly grass covered green. The common is also now adorned with a monument commemorating the Civil War, and at one time had a bandstand. In the 1970’s, the local Community Betterment Committee organized village residents to improve the green once again. The green was mowed (it was previously considered hayfield), playground and benches installed , blue spruce trees (which later died) planted, and culverts cleaned out to alleviate drainage problems. Also, the library was repaired and painted and the old schoolhouse torn down to construct the town office. Plans were drawn up for a bandstand, but were later tabled. In the 1990’s, Henrik Kruse donated funds to improve and maintain the common. At that time, the town installed piping under the common to improve drainage, constructed a post and beam gazebo, replanted trees, planted gardens at the western and eastern ends, replaced playground equipment, installed fencing along the northern border and upgraded parking lots. Furthermore, the Town Common Committee was created to oversee use and maintenance of the common and Town Common Reserve Funds. As a result of this investment in the common, its use has increased dramatically. The common is now home to community concerts, the farmer’s market, town events, children’s’ educational programs, recreational programs, the town ice rink and broom-ball tournament, and private events. In 2005, the Town Center Committee was created to study traffic calming and pedestrian safety in the common area. This resulted in converting the Y intersection at the junction of Route 128 and Common Road into a T intersection, removal of eth playground and installation of an ADA and public safety compliant swing set, removal of the fencing and gardens due to sight distance/driver safety concerns, installation of over a dozen swamp oak and autumn blazed maples, re-leveling of the area housing the ice rick, and paving the eastern parking lot. The library also extended its lawn area and constructed a parking lot on the western side of the building. In 2014, UVM students released a study on the environmental an aesthetic benefits of the common and associated landscaping. In 2014, the Westford Planning Commission with the assistance of Place Sense developed the Westford Town Common – Conceptual Master Plan outlining the Town Center Committee’s proposed projects and additional future pedestrian paths to ensure pedestrian safety, traffic calming, and further recreational and extracurricular use of the common. Lastly, the Westford Planning Commission began researching the exact location of the southern town common boundary line and plans to have the boundary line surveyed and staked in the coming year to once and for all identify the location of said boundary.